There will be many huzzahs and much back slapping this morning when shareholders gather for their annual meeting at Corporate's Crystal Palace headquarters in McLean, Va.
Last year, companywide revenue rose 2.2%, the first annual increase since 2006. Gannett navigated a tricky technology test, rolling out newspaper paywalls that allowed the company to justify average 25% subscription rate hikes. Through some creative (ahem) accounting, the company claimed an impressive 19% increase in digital revenue. By the end of the year, digital represented 25% of total revenue, making GCI look more New Line than old. And the broadcasting division rode the summer Olympics and national election slugfest to its best year ever. Those are exactly the bullet points in CEO Gracia Martore's annual letter to shareholders, in the glossy 2012 Annual Report. The bottom line, as always, is of particular interest to stockholders: Total return to investors was 41% vs. 16% in the widely-watched S&P 500 list of companies, after a $154 million stock buyback and 150% increase in the annual dividend. Good news like that landed GCI at No. 186 on Barron's magazine's just-published list of 500 companies that did the best job investing for growth. That was way up from No. 378 a year ago. But here's something you won't hear management touting this morning. It's from a less widely read regulatory document, the annual 10-K report. There's a table on Page 28 showing a very different bottom line, one of great interest to longer term investors, including many of the company's nearly 31,000 employees. The table says GCI's annual return to shareholders continues to lag the S&P 500 companies when measured over a longer time frame, 2007-2012 -- a period when the entire newspaper industry was slammed to its knees. That's hardly surprising, of course, because it's an apples-to-oranges comparison. The S&P holds many companies driving the economy's future, including technology heavyweights Amazon, Google and Oracle. Corporate chose the peer group. It includes A.H. Belo Corp., Belo Corp., Discovery Communications, E.W. Scripps, Journal Communications, McClatchy Co., Media General, Meredith Corp., Monster Worldwide, News Corp., New York Times Co., Washington Post Co., and Yahoo. Many of the group's companies have a strong publishing/broadcasting orientation, but the group also includes companies in the digital media industry, according to the 10(k). GCI's stock closed Monday at $20.40, down 12 cents. The company's been relying on those fat subscription price increases and broadcasting's bang-up year -- add-ons that will lose their mojo when comparisons cycle through during the quarter starting in less than two months. To be sure, Digital Marketing Services and the USA Today Sports Media Group are still forecast to pick up the slack, especially starting by 2015. But by then, unless things change, the current top management team will be entering Corporate America's version of lame duck territory: Martore, 61, faces mandatory CEO retirement age in 2016. If you bought GCI at the beginning of 2012, you'll be among the shareholders cheering on management this morning. However, if you're really long -- well, at least there'll probably be complimentary coffee and pastries in the lobby. We’ll hear next from David Winters of Wintergreen Advisors. I’d like to ask Doug a question. You know, you’re one of my heroes. You’ve done an incredible job over the years, and Gannett is I think, it’s one of the greatest companies on the planet. And you’ve been brilliant about allocating capital and being thoughtful. And you know, I just would love to hear your sort of longer term thoughts on the newspaper business because Wall Street despite the obsession with the short-term is so gloomy. And yet you know, this is such a great company and you’re so long-term thoughtful. So just, I’d just like to hear your general thoughts about the business. Because people are just, they’re so negative, and it’s sort of sad in a way. Well, David, you’re right on, and yet it’s an interesting buying opportunity for us. Keep in mind that the Street was going put us out of business in 1999 and they were going to put us out of business in the early ‘90s, and I can go all the way back to the early ‘70s. And when that attitude prevails there’s some interesting opportunities, as when we acquired Multimedia at a very good price. Now the acquisition market hasn’t reflected the Wall Street attitude completely. But it has reflected it somewhat. So as you know, there are assets for sale in the UK that are quite interesting to us and things going on in the US and things that are not yet public. Maybe something is going to happen in the broadcasting market for all the reasons that were mentioned earlier on this call. And yeah, it’s tougher. The revenue is not as easy as it was 15 or 20 years ago, but we’re generating a couple of billion dollars of cash. We can put it to very good use both in traditional businesses and into some of the new businesses that Craig and Gracia have mentioned and have been announced elsewhere. Our Internet world is doing very, very well at $300 million plus. Now, compared to $7.6 billion, it’s not the end of the world, but there’s a good upside there. So I own a lot of Gannett stock and you don’t see any announcements of me selling it. I think it will come back and I think the Street will recognize all the positive economics of the business. But, you know, is it as easy as it was? No, but it’s not going away either. Thanks Doug. And I wish all of you the best and thanks for, thanks for being rational in what has been a very negative Wall Street emotional environment. Well, David, we’ve been rational for as long as I’ve been here and I think the younger management will be just as rational. As long as they follow your example, Doug, Gannett is a long-term winner. I’m right next to them, so they’re not going away. Thank you. I think we have time for one more question after that wonderful one. Later that year, on July 25, 2006, Corporate announced the board of directors had authorized an additional $1 billion in stock buybacks, in a statement quoting Craig Dubow, by then CEO and chairman. 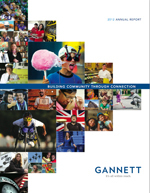 “We believe Gannett’s stock is a terrific value and a very attractive investment,” Dubow said. Shares closed that day at $52.57. By then, Corporate had already spent a substantial portion of the $1 billion earmarked for stock buybacks only a year before. Oy. A long-term thinker he wasn't. A good read, Jim. Thanks for the research and insights. Think of what some of this useless buyback money would have done to attract serious journalists or build morale among company high performers not enconsed at the crystsl palace upper floors. 9:40 AM - It certainly wouldn't have done anything for the stock price, nor would it in any way have improved the long term prospects of the company or the industry. And all the whiners would still be whining. Another alternative would have been to invest in technology. Still today, the amount of time required to, for example, redesign and relaunch the community newspaper websites is shockingly long. It's now going on TWO YEARS since that project was first announced. That's like 20 years in Silicon Valley time. Speed to market can definitely drive revenue and then the stock price. When Gannett got drunk on its own ale, buying stock instead of investing in the future, the company was set back many years. Given the choice to innovate and grow, Gannett got safe and plowed its available cash into itself at the expense of its future. The move was arrogant, short-sighted, and a reflection of how little innovation was available throughout the organization. If you sell what people are willing to buy, you will make money. If people do not want to buy your product, then you either have to devise a means to change either the product or its appearance, or close the doors.